In this post We have discuss topic like how to upload CSV file for update mysql table data by using PHP script. We have received to many request on make tutorial on how to update mysql data by uploading CSV file by simple PHP script. 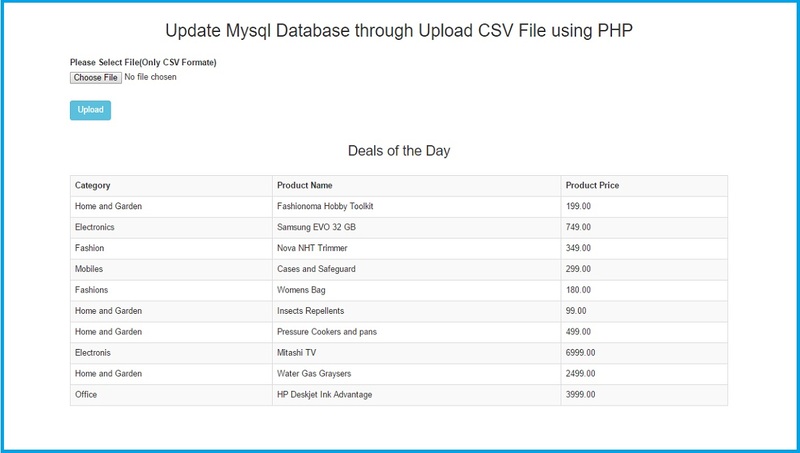 In one of our previous tutorial we have already learn how to insert data into mysql table by uploading CSV file using PHP code. But now here topic is something different, here we do not want to insert data but we want to update existing inserted data by uploading CSV file using simple PHP code. This type of feature mainly used if you have manage online store or online restaurant booking system in which you want to update data on daily basis. For example, suppose you have run online store and on your website home page want to display daily different product then at that time if you have build this type of feature for your web application. By using this feature you can easily update existing data and that data you can display on your web application. So this way you can use this feature for display different data on your web application. In simple terms by uploading file you can edit large amount of data in single click event. For developed this type of simple application we just want knowledge of PHP script filesystem function. Here we have used fopen() and fclose() function for open file for data from particular file. After this we have use fgetcsv() function, by using this function we can get comma separated values data in array format. After getting CSV data in array format, then after we have make simple mysql update data query for edit existing data in database. This way we can update existing data of Mysql table by using CSV file using simple PHP script.